Let the above be a reminder to ye: At least once a week go check out the amazing work BUD BURGY is doing bringing to life my script for CONTINUITY GUY: CHRONO CHAOS!!! ALSO: This Friday–NOVEMBER 26th aka “BLACK FRIDAY“– I will be at The Source Comics and Games helping to promote “SUPER HEROES, STRIP ARTISTS, and TALKING ANIMALS” by BRITT AMMODT. I don’t have any actual details beyond that, but hopefully I will by Wednesdays post. TC: FCBD–part 6(of 12)–by Bastian and Dank, also: Britt Aamodt’s book on MN cartoonists (including myself) debuts Saturday at ‘Book Fest’, and the ‘Geek Report’ and ‘Fallcon’ are Saturday too! BRIAN BASTIAN: If you’re too young to remember the Hostess cake ads they used to run in comics back in the day, they were awesome. It was like you were getting a free short story and an advertisement for sugar. I’d like to say that having Tommy Chicago stealing my wallet was a metaphoric statement on how he eats up a lot of my disposable income, but in fact I just thought it would be funny. I was really happy with the ending too. Its a great point to get out of the story, but it left the door open if we wanted to do another story. Know whats AWESOME about the TWIN CITIES BOOK FEST going on this weekend? Well, YES, it is a FREE EVENT and that is pretty rad. 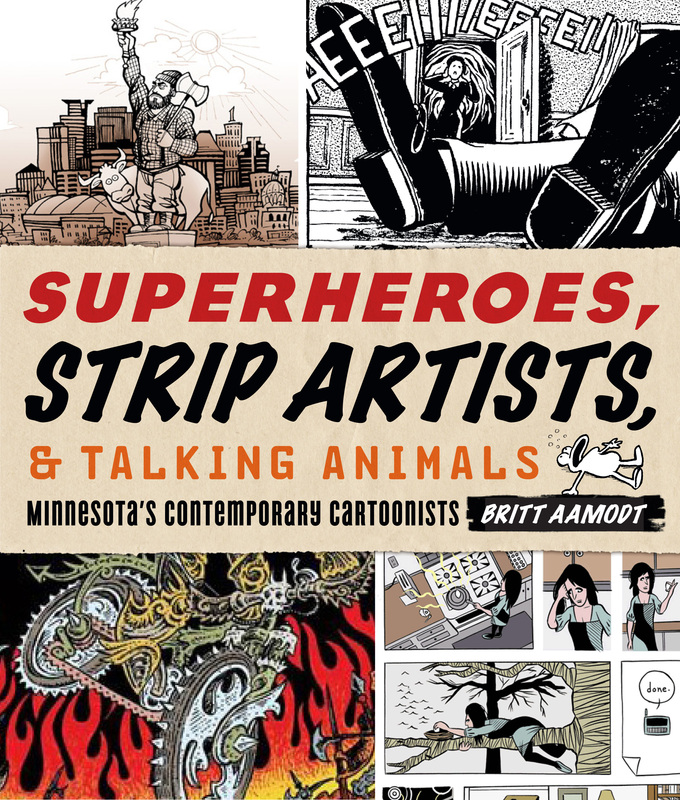 But what’s even greater is that BRITT AAMODT’s “SUPERHEROES, STRIP ARTISTS, and TALKING ANIMALS: ESSAYS ON CONTEMPORARY MN CARTOONISTS” will be debuting nigh-on a month ahead of it’s release date at BOOK FEST this Saturday!!! The book features both interviews and the art of many of your favorite MN cartoonists including several Conspirators. The official run-down of artists looks like this: Kirk Anderson, Ken Avidor, Terry Beatty, Big Time Attic: Zander & Kevin Cannon, Will Dinski, Patrick Gleason, Peter Gross, Christopher Jones & Melissa Kaercher, Dan Jurgens, Ryan Kelly, Reynold Kissling, Danno Klonowski/Dank!, Bob Lipski & Brian Bastian, Roger Lootine, Doug Mahnke, Gordon Purcell, Brittney Sabo, Zak Sally, Barbara Schulz, Tim Sievert, Andy Singer, King Mini/Vincent Stall, andSteven Stwalley. So come pick a copy this weekend. Dare I suggest–the perfect stocking stuffer for your loved ones who love comics??? So yeah– Tomorrow SATURDAY, OCTOBER 16th I will be at the TWIN CITIES BOOK FESTIVAL at the Minneapolis Community & Technical College. I’ll be joined by my friends and fellow Conspirators KEVIN CANNON, MIKE TOFT, LUPI McGINTY, BILL PRENDERGAST, and BRITT AAMODT. The show runs from 10am to 5pm. Afterwards I’ll be running across town to record the latest episode of THE GEEK REPORT (with special guest RYAN DOW). Meanwhile, BRIAN BASTIAN (and, uh…everybody else) will be at FALLCON in St Paul. We’ll be discussing both BOOK FEST and FALLCON at length on the GEEK REPORT, so if you miss either, we’ll give you the recap! And don’t forget–every issue of FALSE WITNESS: THE MICHELE BACHMANN STORY (including the all-new #4) will be for sale every THURSDAY thru SUNDAY night in OCTOBER at the stagings of MICHELE! A MUSICAL BACHUMANNTARY. There’s a good chance I’ll be there as well selling’em! Superman soared out of a Depression-era America desperate not for just a hero but a superhero to prevail against the crushing realities of life. But as comic book readers escape into a rich world of words and pictures, it’s easy to forget the slumped-over figure at the drawing board—the cartoonist, who may live in Metropolis for much of the day but still calls Minnesota home. In Superheroes, Strip Artists & Talking Animals, Britt Aamodt coaxes twenty-three contemporary artists from Minnesota’s burgeoning cartoonist community to talk about one of America’s most colorful, irreverent, misunderstood, and sometimes demonized art forms. The cartoonists’ work spans comics, graphic novels, comic strips, editorial cartoons, minicomics, and webcomics. In their careers, these artists have conspired in the death of Superman, envisioned an interstellar space cop network, devoted an entire strip to a dead chicken, and created a Third World dictatorship that felt awfully familiar to contemporary American readers. Along the way, the cartoonists share their stories of breaking into comics and the realities of an industry that has hit pay dirt in Hollywood with comics-based movies but is witnessing the migration of strip artists from paper- to web-based publications. Follow them in this fully illustrated book as they draw their future, frame by frame. Artists include: Kirk Anderson, Ken Avidor, Terry Beatty, Big Time Attic: Zander & Kevin Cannon, Will Dinski, Patrick Gleason, Peter Gross, Christopher Jones & Melissa Kaercher, Dan Jurgens, Ryan Kelly, Reynold Kissling, Danno Klonowski/Dank!, Bob Lipski & Brian Bastian, Roger Lootine, Doug Mahnke, Gordon Purcell, Brittney Sabo, Zak Sally, Barbara Schulz, Tim Sievert, Andy Singer, King Mini/Vincent Stall, and Steven Stwalley. Britt Aamodt is an arts journalist specializing in pop culture, visual arts, and artists. She founded the radio theater troupe Deadbeats On the Air and has adapted graphic novels for radio.